Your family or business depends on Clean Water! We can help. 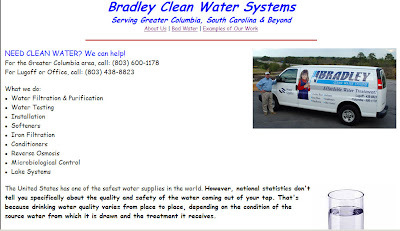 We provide installation and service of water systems and equipment in South Carolina and parts of North Carolina. Our Website and Blog are both open to the World Wide Web today! Welcome and we hope you will find our website and blog helpful. Call us when you have any needs related to water quality testing and improvement. We serve most of South Carolina and parts of North Carolina.